Plantar Fasciitis is a chronic pain in the heel that can just appear from nowhere but it is actually a long standing mechanical condition caused by prolonged stress on your foot. In most cases Plantar Fasciitis is a common, but very treatable, mechanical condition of the foot and responds positively to orthotics. A heel pain caused by prolonged stress on a ligament like structure in the arch that is very important in weigh-bearing activities. The tissue becomes damaged and needs to be helped to repair in order for the pain to go or subside to a manageable level. Orthotics for your feet can achieve this necessary healing for pain relief. It can be very painful, and even debilitating for sufferers. Let's start with the plantar fascia [pron. plan-tar fash-e-ahh] itself to understand a little more about what is happening to your heel and how you get pain from it. The Plantar Fascia is a strong ligament-like structure under the arch of the foot that runs from the heel bone to the ball of the foot. If we could see it in isolation it has a triangular shape when looked at from underneath but has a curved shape when looked at from the side - much like a sail boat's sail billowing in the wind. The most functional piece is from the front-bottom-inside area of the heel bone (calcaneous) to the joint of the big toe (hallux) and this is where the majority of stress of walking (and running and jumping) is taken by the fascia. How your plantar fascia reacts to and recovers from this stress is what determines the extent and nature of your plantar fasciitis. The job of the plantar fascia is to aid the foot's bone structure to absorb shock that happens during your gait (walking pattern). Even though it goes against common perception you can have a high-arch foot and get plantar fasciitis as well as the more common low-arch foot posture associated with PF - tightness doesn't discriminate! 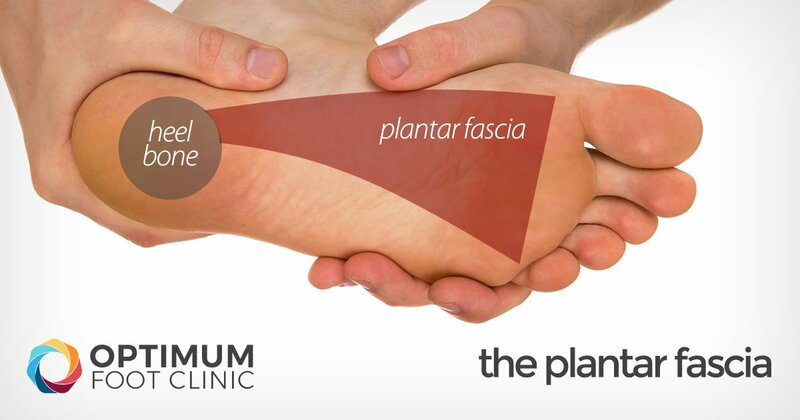 The plantar fascia is involved in stabilizing your foot not only at heel strike, when most people experience pain, but also right through until the foot leaves the ground after the stress has moved from the back of the foot to the big and lesser toes as you 'push off' - all this increases the stress on the plantar fascia and not just at the point where it is attached to the heel bone. What most people, even medical professionals, don't realise is that is has been happening for a long time before it becomes evident (you only notice it when your heel starts to hurt when you stand and move). Plantar Fasciitis – Or Is It? Plantar Fasciitis [pron. plan-tar fash-e-eye-tiss] is actually, in most cases, plantar fasciosis but it's a bit like pen/biro or hoover/vacuum. The term '-itis' means 'inflammation'. This is a term we use for this problem in the early stages of damage because it usually is quite literally an inflammation of part of the plantar fascia. So, what is commonly known as 'plantar fasciitis' is really 'plantar fasciosis' - a degradation or degeneration of the collagen fibres because of prolonged (most of your adult life) unsustainable stress being applied to the fascia. So, we call it plantar fasciitis but it usually hasn't been an '-itis' for years and that is why in many cases anti-inflammatory drugs do not help ease the pain of walking. This is also why most sufferers experience pain first thing in the morning. If inflammation was the source of discomfort then why would it hurt after a nights rest and the good old drugs pumping through your system. The answer is simple - the damage we need to affect for a successful treatment (ie pain relief) is actually structural (caused by mechanics - the way we move) so standing up out of bed gives most sufferers a massive pain in the heel/foot straight away. Many people have 'bad biomechanics' - the way our anatomy is set up and used during activity. Our bone structure and the way it is positioned and how we use it with the help of muscles, tendons and ligaments is another example of genetics - the same as hair colour and eye colour. This is why many family members will have the same shaped body structure and walk with similar gait patterns. So What Causes Plantar Fasciitis? OK, let's be a bit more specific. We have so far learned that stress built up over time in the plantar fascia becomes degraded to the point of damage and that leads to pain but what causes the stress to build up in the first place? When some people stand/walk/run/jump their own anatomy in their ankle joint is not 'sturdy' enough to cope with the needed stabilisation of their ankle joint when they are weight bearing. So, their ankle rotates to find a point of stability. By the shin twisting in and the ankle rotating downwards to the inside (along with your body weight, the power of some muscles, and of course, gravity) a huge amount of stress is applied to the plantar fascia until it is stressed beyond it's normal limits and it starts to 'tighten up'. It is this tightening up of the plantar fascia under this stress that causes the damage that in turn leads to pain...eventually. Prolonged (...many many years...) of this stress leads to the deterioration of the fascia on a cellular level causing a thickening of the fibres as well as a decrease in the blood flow to the tissue. This is when the pain kicks in. It is a really painful thing to suffer from. I know, I've experienced it myself. A properly designed orthotic based on a correct and thorough assessment will do one thing to ease the pain of plantar fasciitis - reduce the stress of standing/walking/running/jumping on the plantar fascia. And, I'm afraid, in most cases an arch support will not do the job. Arch supports and insoles are not orthotics because they do not take into account a number of factors related to correcting the 'bad stress' applied to the plantar fascia. Namely, rotational forces that lead to an imbalance of forces around the ankle joint. That is why custom foot orthotics are better at 'treating' plantar fasciitis than insoles. Think of it this way, if you are using an arch support to 'push back up' the arch then by definition it has already 'come down'! That means the plantar fascia has already been stressed and you are fighting a losing battle. 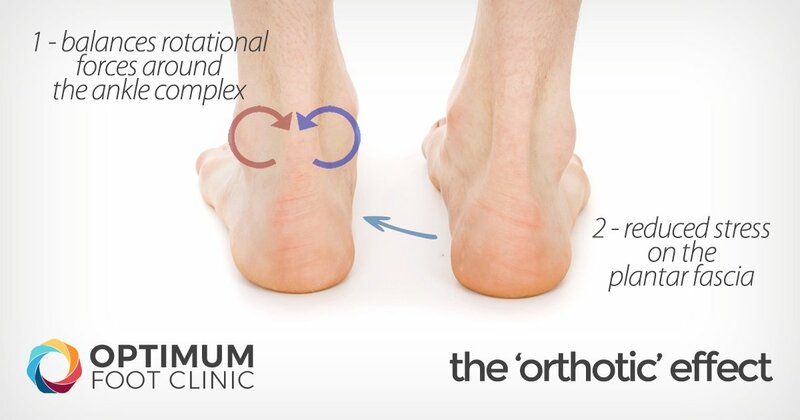 With a correctly designed orthotic the stresses are reduced because the foot and ankle complex are influenced to behave in a more normal way and not rotate in such a way as to stress the fascia to a point of damage. Can We Help Your Heel Pain? 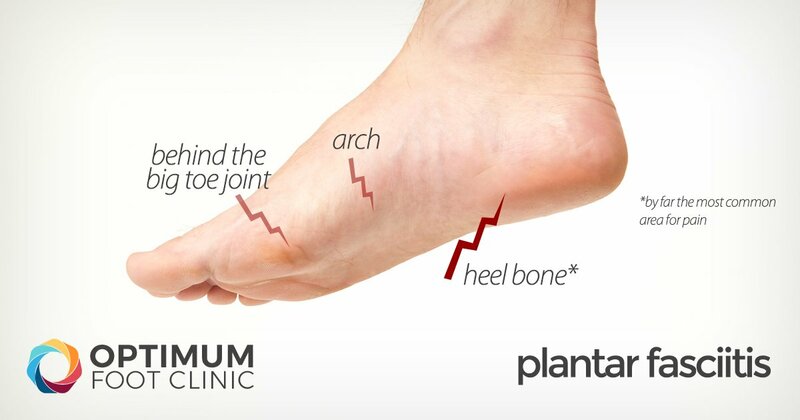 Would you like to avail of a FREE assessment of your heel pain? Just fill in the form below and click 'Submit'. There is no obligation to continue with orthotic treatment and if we feel you need some other type of treatment we can refer you to the appropriate person. How old are you (yrs)? Would you describe your activity level as...? Any details about you current issues that you would like to add? If you or someone you know is suffering from plantar fasciitis or any other foot and ankle issue then please take advantage of our FREE consultation and let us get you back on track. You can book an appointment for any of our clinics by calling (01) 5052130 today. Many private medical insurance companies and schemes such as Aviva, VHI, Laya, Garda Medical Aid, HSF and more. © 2019 Optimum Foot Clinic - Lower Limb Orthotics Therapy. All Rights Reserved.